The Map menu sets which clip in the timeline is used to create the distortions. Note: If the Map Layer is partly transparent, the displacement amount scales by its alpha values. Pixels whose map alpha is 0 are not displaced. Note: The remaining parameters are identical to the corresponding controls in the Displacement Map ﬁlter. See the Displacement ﬁlter for more information. Preblur: applies a blur to the clip. Increasing Pre Blur can help eliminate sharp edges in the map to create a smoother effect. Blur Threshold: softens the clip before computing the distortions. Map Black Level: sets the channel values of the clip that are output as pure black. Map White Level: sets the channel values of the clip that are treated as pure white by the ﬁlter. Map Gamma: adjusts the midlevel gray values of the clip by adjusting the gamma. View Map Checkbox: allows you to view the clip as you adjust it. 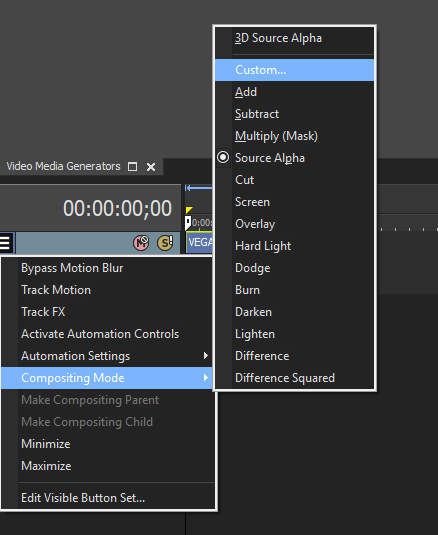 Deselect this option before rendering. Master Displacement: control defaults to 100 and scales all of the displacement amounts. Animating this controls allows you to animate the total displacement. Red Direction, Green Direction, and Blue Direction set the direction of the displacement controlled by the red, green and blue channels in the Map Layer. Red Displacement, Green Displacement, and Blue Displacement set the amount of displacement, in pixels, that the ﬁlter applies to portions of the image corresponding to pixels in the Map Layer whose matching color channel is fully on. If a pixel in the Map Layer has a color channel that is fully off, then its corresponding image area is displaced in the amount determined by the matching Displacement value, but in the opposite direction. Red, Green, and Blue Reference Level: Determines the amount of each color is in the pixels. The Map Behavior menu sets how the map is applied when the Map Layer image is a different size than the ﬁltered clip. If your map is the same size as the ﬁltered image, the Map Behavior settings all produce the same result. Center Map centers the map on the source and does not displace the source image outside the boundaries of the centered Map Layer. Stretch Map to Fit resizes the Map Layer to the size of the source. Tile Map creates tiles from the Map Layer and uses them to displace the source. Tile Map only has an effect when the map is smaller than the source image.